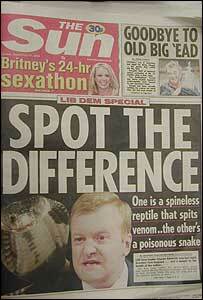 When it comes to hypocrisy no-one can outdo the British press. Virtually the whole of the British press, with the exception of the Daily Mirror, supported Britain’s invasion of Iraq. An invasion that killed up to 1 million civilians. There were no terrorist groups in Iraq before the invasion. There were no weapons of mass destruction either. The only thing Iraq possessed was an abundance of oil and it was this that the United States was determined to lay its hands on. After the invasion in 2003 Al-Qaeda in Iraq grew in leaps and bounds. A few years later they changed their name to ISIS. Thus began the growth of this monstrous death cult. 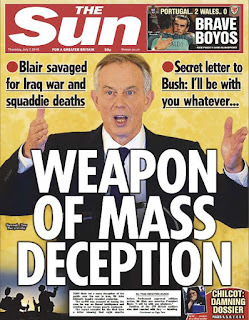 ISIS was a product of the bloody war that the United States and Blair’s New Labour imposed on Iraq. Nor was it accidental. When the Americans ran into heavy armed resistance in Iraq they did what all imperial powers do, they played the divide and rule card. The US and Britain deliberately sowed the seeds of division between Sunni and Shi’ite Muslims in order to shore up their own positions. Donald Trump today is still doing this. 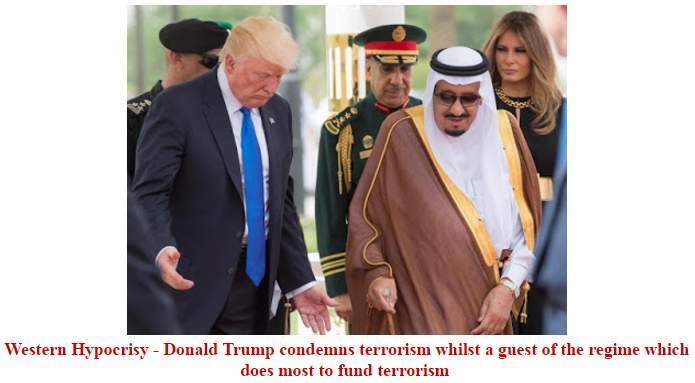 He went a few days ago to Saudi Arabia to condemn the Iranian terror axis in the Middle East! ISIS, Al Qaeda and the other Jihadi groups in Syria and Iraq are 100% Salafist Sunni groups. Hezbollah, the main Shi’ite guerrilla group in the Lebanon, which is allied with Iran, has never exploded bombs in Western cities. Nor has Hamas, which is Sunni. Both condemned Al Qaeda for its Charlie Hebdo murder yet they are called 'terrorists' because they fight or have fought the terrorist regime in Tel Aviv. The western press deliberately conflates organisations which fight a guerrilla war against Israel with organisations that butcher and murder anyone who doesn’t subscribe to their definition of the Islamic faith. In reality ISIS are not motivated by Islam. It is a flag of convenience. Much fun was made of ISIS recruits in this country who bought Islam for Dummies before setting out on their Jihad. Those who murdered and maimed in Brussels and France, almost without exception, were petty criminals who drank and led anything but a pious Islamic way of life. Being a Muslim was a way of dignifying their alienation. Not content with what it had done in Iraq, Cameron and Clegg also decided to intervene in the Libyan civil war. Despite Britain’s previously close relations with the Ghadaffi regime, we decided to repay old scores and support the Islamic opposition to his regime. The consequences were predictable. Once again Al-Qaeda, ISIS and various Jihadist groups thrived. 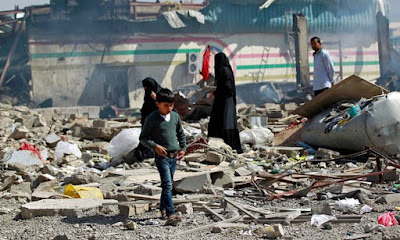 Ghadaffi had warned of just such an outcome but we decided on another ‘humanitarian’ bombing campaign. 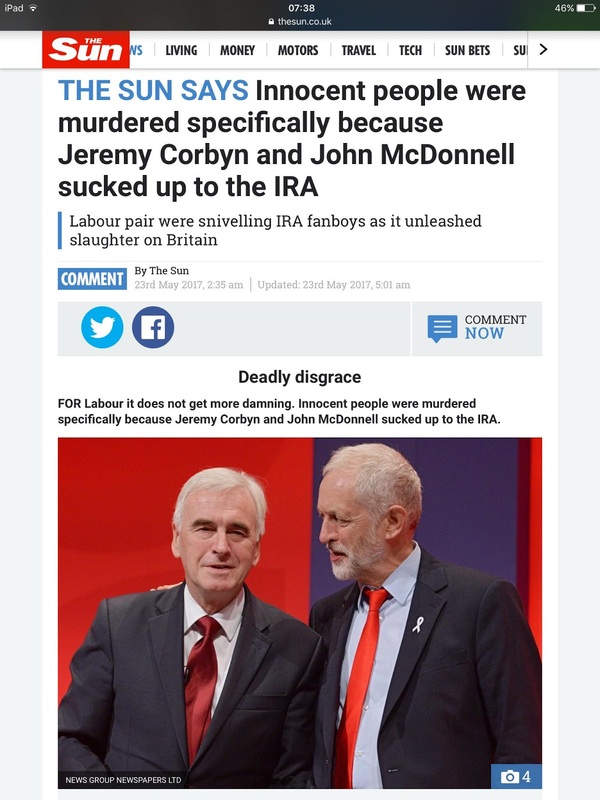 On Tuesday the Sun came out with a headline accusing Jeremy Corbyn of having blood on his hands. The irony is that it is the Sun which is covered in the blood of the innocents. 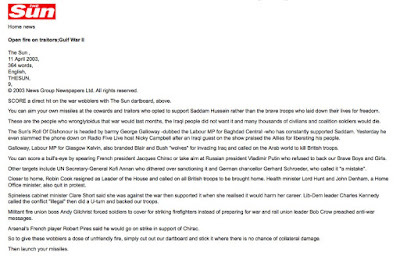 As the headlines displayed here should remind people, the Sun was the chief cheerleader for the illegal war in Iraq. 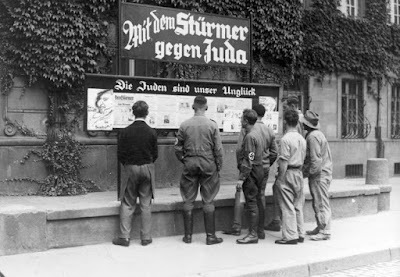 In Nazi Germany the editor of the Nazi newspaper, Der Sturmer, which did most to support Hitler’s wars of aggression and the attacks on the Jews, one Julius Streicher, was hanged at Nuremburg in 1946 for crimes against humanity. 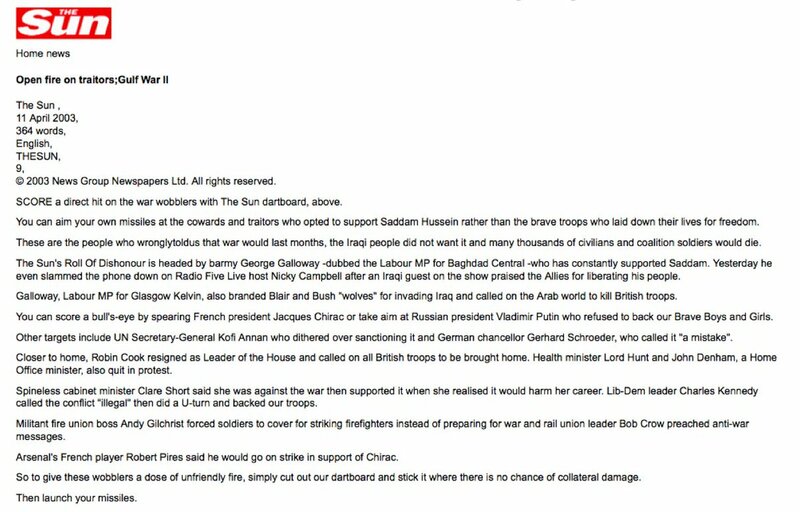 Instead of being feted by Prime Ministers, Rupert Murdoch should also be treated as a war criminal. 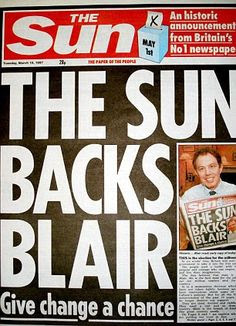 The Sun’s reference was not to Manchester but Corbyn’s previous support of Sinn Fein and the Republican movement. It is to be hoped that Corbyn does not duck the challenge. Jeremy Corbyn did indeed support the fight of the Catholic people of Northern Ireland for justice and a United Ireland. People forget that up to the imposition of Direct Rule in 1972, Northern Ireland had been a Protestant supremacist police state (much like Israel and South Africa). If you were a Catholic you couldn’t get a job in the civil service or decent housing. Discrimination was institutionalised in a state which the former Prime Minister, Lord Brookeborough described as a Protestant state, which it was. Northern Ireland was created in 1921 after the all-Ireland elections in 1918 had produced a Sinn Fein majority. This was unacceptable to the Tories allies amongst the Unionists who threatened to use force to reverse the results of the election. Thus began Ireland’s war of independence. When in 1969 the Catholics launched a civil rights movement they were viciously attacked by the B-Specials and Protestant supremacists at the Battle of Burntollet. It was the ‘spark that lit the prairie fire’ i.e. the Troubles. The Catholic ghetto of the Bogside in Derry was attacked in a two day battle by the RUC and B-Specials (a paramilitary police force). A civil rights march in Derry was attacked by the RUC. This was the beginning of ‘The Troubles’. To those who want a greater understanding than that provided by the Sun then The Troubles in Derry article provides a starter. It was only when Britain accepted that the North of Ireland could no longer be a Protestant supremacist state that a peace accord was possible. The IRA fought a war with the British. Undoubtedly they, like the British Army, killed many innocent civilians. That is always the consequence of war. 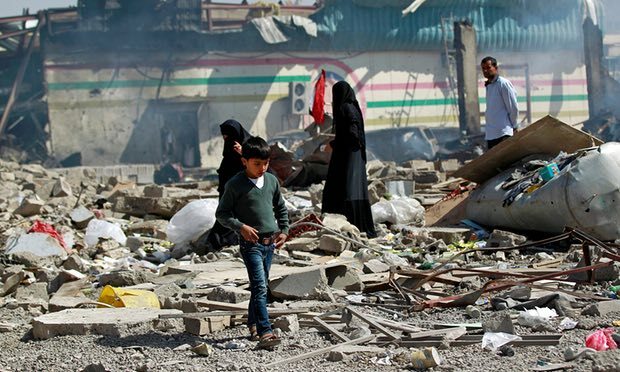 Britain and the US call it 'collateral damage'. However the IRA killed far fewer civilians than the British army in Iraq, Afghanistan or elsewhere. 21 years ago the IRA exploded a massive 1500 Kg bomb in Manchester city centre. It devastated the heart of Manchester yet not one person was killed. The reason? They gave a 90 minute warning. On occasions elsewhere, not least Birmingham, when warnings went astray or weren’t heeded, people did get killed, however the IRA never deliberately murdered civilians. Protestant paramilitary groups like the UDA and UVF, which the British Army and its secretive Forces Research Unit infiltrated with agents, deliberately targeted Catholic civilians. That is one of the major differences between the IRA bombing campaign and that of ISIS and the US military. The latter two don't give warnings when they bomb people. It was also the case that the IRA and Sinn Fein had and continue to have massive support in the Catholic ghettos of Northern Ireland. The fact that the majority group amongst Catholics in Northern Ireland is Sinn Fein not the SDLP is proof of that. ISIS by contrast has to terrorise the inhabitants of the areas it controls. In the article below, Patrick Coburn exposes the hypocrisy of the British political establishment and Theresa May. Saudi Arabia's Wahabist regime and Qatar have sponsored, armed and funded ISIS, Al-Qaeda and a host of Jihadist groups in Syria and Libya. The regime in Saudi Arabia, under King Ibn Saud, was armed and funded by the British in the wake of the first world war. 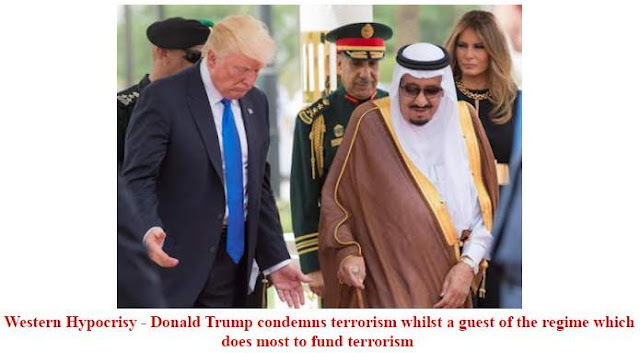 We have continued, with the United States, to support them ever since, for the simple reason that this most austere and barbaric version of Islam is ideal to keep the population of Saudi Arabia cowed. What better way of legitimising repression and coercion than religion? For us to condemn the head choppers of ISIS when we support the head choppers of Saudi Arabia is the kind of hypocrisy for British imperialism was long renowned. 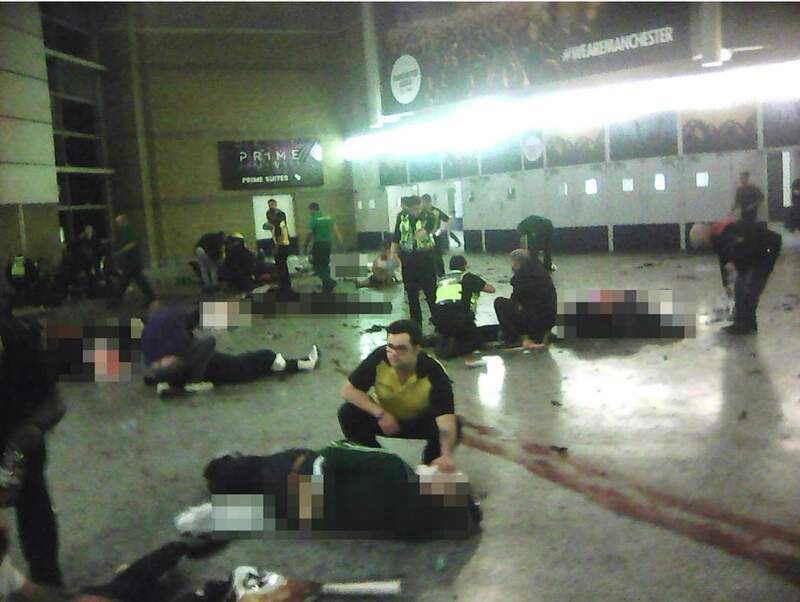 The attack on Manchester Arena – and those on the Bataclan and the Pulse nightclub before it – can trace their roots to the Wahhabism of Saudi Arabia. The UK and US governments just won’t admit it.